Solution: Replace it. Refrigerator water filtration system filters should be replaced at least every six months. 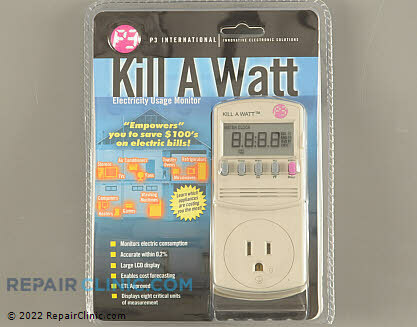 Depending on usage, you may need to replace yours more frequently. Read your refrigerator owner’s manual for instructions specific to your model. It’s a good idea to stock up on filters to save time and money. Enter your refrigerator’s model number here to find the manufacturer-recommended filter for your specific model. If you’re not often retrieving ice cubes, it could be that the old ice has absorbed odors from its food neighbors inside of your freezer or refrigerator. Food gases are easily transferred to water and ice. In fact, ice cubes can easily absorb odors from spoiled food inside of your refrigerator’s interior compartment. Solution: Use ice cubes more frequently. Keep your refrigerator and freezer free of spoiled food. Possible cause 3: Unhealthy water supply. If your city or well-provided water is full of impurities, minerals, salt or sulfur, your water and in turn, your ice cubes, will have an unfavorable taste and odor. Possible solutions: Make sure you regularly replace your water filtration system’s filter. If your refrigerator doesn’t have a built-in water filtration system or an in-line filter on the water line to your refrigerator, consider this easy-to-install refrigerator water filter kit. It will remove impurities and chemicals to improve water quality and taste. Hard water may also be affecting the water quality. You can test for water hardness with these water test strips. You may need a water softening system. If you already have one in place, it may be using too much salt. Consult your water softening system owner’s manual and adjust settings as needed. Slight, but important tangent, since we’re on the subject of water filtration: Ever hear of reverse osmosis (a.k.a. hyperfiltration) water filtration? It’s the process that many water bottling companies use to reduce the amount of impurities and minerals in water. Today, there are such systems available on the market for residential use. However, one should never connect a reverse osmosis filtration system to a refrigerator water supply – due to the possibility of reduced water pressure that can lead to refrigerator problems and expensive repairs. Possible cause 4: Improperly sealed or unwrapped food inside of your freezer. Fresh and old ice cubes alike will absorb food gases. Possible solution: Regularly clean out your refrigerator and freezer, tossing out expired foods. Double wrap and bag products with weak packaging (this will also help prevent freezer burn). Use a deodorizer like this one that’s specifically designed to combat strong food odors. We also use a refrigerator deodorizer in our refrigerator compartments, too. According to the manufacturer, this refrigerator deodorizer is 50 times more powerful than baking soda in keeping refrigerators smelling fresh. It lasts up to six months and keeps highly-perishable food like fruits and vegetables fresher longer. Check out additional freezer and refrigerator deodorizers and cleaners here. Possible cause 5: Food spills or mildew growth inside of the freezer or refrigerator compartments. Solution: Thoroughly clean the inside of the freezer and refrigerator using a solution of warm water and baking soda. The solution should be about one tablespoon of baking soda to one quart of water. Avoid using cleaning products with harsh chemicals such as bleach or ammonia, as they may damage your refrigerator’s interior walls. Check your refrigerator owner’s manual for specific instructions related to cleaning and mold removal. Something broken? RepairClinic has free troubleshooting and repair help information for refrigerators and ice makers. Please enter your model number here for model-specific repair help and troubleshooting information. 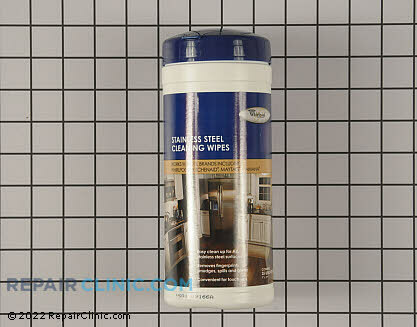 Stainless steel wipes keep stainless steel surfaces sparkling clean. The advanced formula is ideal for cleaning food spills, grime and stains. It leaves surfaces shining like new. Use Whirlpool Stainless Steel Wipes on stainless steel sinks, refrigerators, dishwashers, ranges, microwaves and cookware. Contains 35 use and toss wipes. To use, remove one wipe from container. Rub lightly on stainless steel surface. Shine appears as formula dries. No need to wipe with additional cloth. This freezer deodorizer traps odors circulating in freezer air before they are frozen in ice cubes (not from water supply). 50 times more powerful than baking soda. Contains high absorbency activated charcoal. 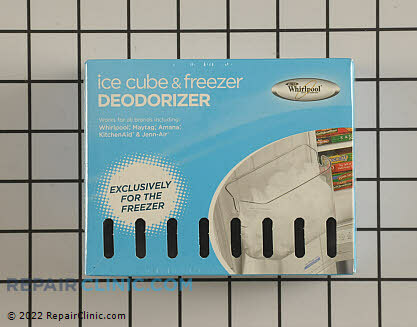 Deodorizer absorbs odors from freezer air. Replace every 3 months. To use, discard existing ice cubes and replace with a fresh supply. Remove protective film and place on top freezer shelf. For best results, use with Refrigerator Deodorizer. Now is a good time to make sure your ice maker is working properly. RepairClinic Ice Makers and Parts has virtually every ice maker and ice maker parts for all brands of refrigerators. The most common ice maker is the Whirlpool ice maker which also fits most Kenmore and KitchenAid refrigerators in which the ice maker mounts on the left side interior wall in the freezer side. Fridge Aid – Removes odors from refrigerator or freezer. Better than baking soda. Uses coconut shell instead of soda or carbon. Lasts up to one year.